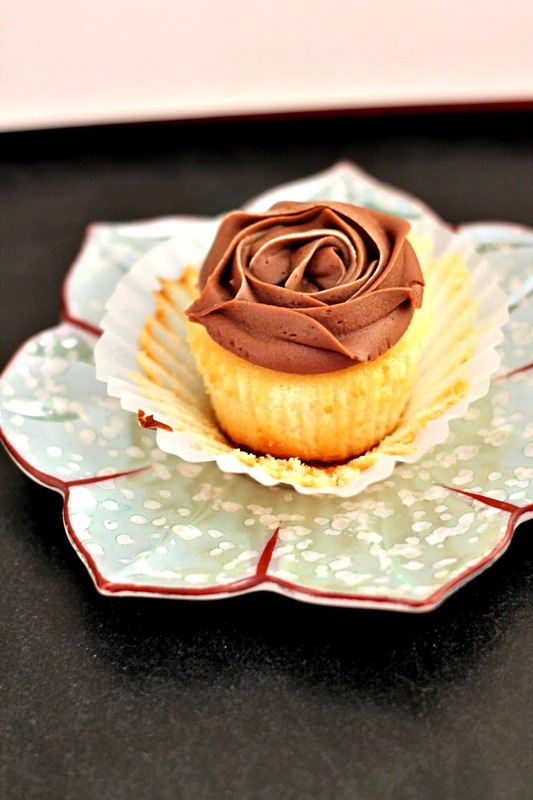 What I love about this recipe is that it is super quick to whip up and makes a small batch of cupcakes. Which means I won't be eating a dozen cupcakes in a matter of a couple of days. When it comes to desserts I find that I have lost all self control. So small batches are good although this recipe can be easily doubled. I frosted them with the recipe from my Quick Chocolate Cake. Heat oven to 375 F. Line a muffin tin with 6 paper liners. In the bowl of an electric mixer whisk together flour, sugar, baking powder, vanilla powder and salt. Add egg and milk. With the mixer fitted with the paddle attachment, on medium speed mix for 2 minutes. Add margarine/butter and beat on low for 1 minute. Scrape down bowl and beat on medium-high speed for 1 1/2 minutes. Scrape down bowl again and beat on low speed for 30 seconds. Fill muffin cups and bake for approximately 15 minutes or until toothpick inserted in the middle comes out clean. Cool in pan for 10 minutes. Transfer to a wire rack and cool completely. Beat all the ingredients in the bowl of an electric mixer until creamy. Add the amount of milk according to how thick or thin you would like the icing to be. The amount of milk I have used works great if you are piping the frosting. If you aren't piping you may want to add more milk. G'day and how pretty, true! WISH you could share some piping hints and tips too! Great photo! Hi Joanne! Thanks for stopping by my blog and your lovely comment! I am an amateur when it comes to piping but this design is very simple to make. Use a 1M tip. Start in the centre of the cupcake and pipe the swirl around until you get to the edge of the cupcake. Simple! frosting looks fabulous asiya.Love the small batch too .I will be doind it very soon for the thanks giving. The cupcake looks lovely Asiya ! Drooling here.. Yummy it looks..
that plate is so gosh darn cute! This is such a gorgeous shot! I loveeee the swirl! How did the banana cream pies turn out? Did you take pictures? I would love to decorate cakes nicely. I always have big plans about how I am going to decorate a cake and it never comes out how I imagined. They were incredible! I did take pictures but I didn't think that they came out nice :( I'm making another banana cream pie next week though iA (a close friend is coming to visit), so I'll hopefully get to take better pictures. Do you have Michaels or Joann's in Toronto? They're fabric/craft stores that offer cake decorating classes. I've been thinking about taking a course, but it never seems to work out with Owais' schedule. Colourfull cupcakes. Loved it completely. I divide the batter equally among 6 muffin tins. They are probably more than 2/3 full. Would I not use the 1/4 of salt if I use salted butter?